Where is my geometry box ? This is one question everyone must have heard a lot of times when they studied in school. It is especially hard to find out yours when the whole class has one type of Geometry box. Natraj had a monopoly over the Geometry boxes back then. Coming to what is inside the box. You will be surprised by the presence of time table provided by Natraj below the top metal flap. Though you never use them, you considered it special. Taking all the items in the geometry box outside and filling them back in gave you the feeling of an assassin assembling his sniper out from his case. 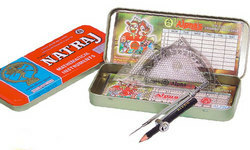 Though Natraj gave you wonderful erasers back then, it was kind enough to give opportunity to someone else when coming to the eraser in the Geometry box. 9 out of 10 times it did not do justice to its presence but that’s when your Natraj from your pencil box came to your rescue to show the other one how it is done. Drawing a complete circle with a compass was a challenge to many kids when they got things started. But i used to follow a technique for which i am not proud of. I used to move around 60 degrees with the compass shifting my position by the way when i drew a circle. Though i could do this in the classes easily, examination hall was a very big challenge. It was also also the safest place to keep coins beneath the plastic layer inside the box. However when you shake the box, you will find them anyway. One of the most intelligent marketing decisions was to sell these devices alone as we would not need all of them all the time. As a matter of fact, i have never used the set squares till now. Probably for the same reason, you can’t get them alone anywhere. Geometry box used to be our prized possession when we went to school though it contained many elements that inflicted danger. There was a boy in my class who keeps talking with the compass in his hand and we used to patiently listen to him until he keeps it down.